Love by Cirque du Soleil - Cirque Insider Access discounts - Hotels Etc. 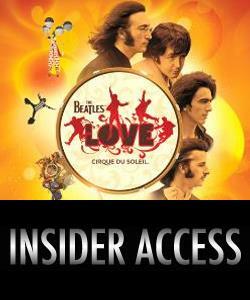 Experience The Beatles™ LOVE™ in a whole new way with this Cirque du Soleil Insider Access package. Along with a backstage tour, a LOVE souvenir program, and an exclusive lanyard, the package comes with an exclusive “Cirque du Soleil 25” CD, perfect for reliving this musical extravaganza for many years to come. Includes intimate backstage tour, exclusive premium seating, and much more! The Cirque Insider Access package is now available for guests who are looking for the ultimate, in-depth experience of Cirque du Soleil and its world famous production LOVE™. Come witness the musical legacy of the Beatles with an exclusive and intimate backstage tour, premium center section seating, front of line access to the theater and concessions, exclusive Cirque du Soleil merchandise including the popular 25th anniversary CD: “Cirque du Soleil 25” and much more! There is extremely limited availability for this package. The backstage tour experience takes place the afternoon before the performance. All guests must be in attendance prior to the tour to be included. Because of the nature of the production, artist training and stage preparation, tours may be modified or altered based on the date. The tour experience will include a full, behind-the-scenes tour with a very small group to observe the stages, cranes, show props and other surprises that will make this truly a once-in-a-lifetime experience.